Note: “Dessau Waltz” was reissued on the New York REPUBLIC label (# 006) credited to James Heap And The Ranch Hands. The reverse of REPUBLIC 006 was “Happy Birthday Polka” by Gabe Drake And The Herdsmen. 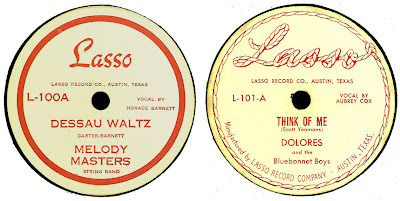 “Dessau Waltz” was also reissued on 4 STAR X-25 wrongly credited to Delores And The Bluebonnet Boys. Note: “The Austin Waltz” was reissued on 4 STAR X-25. Note: LASSO 100 thru 105, and 107 are Research Craft Pressings. 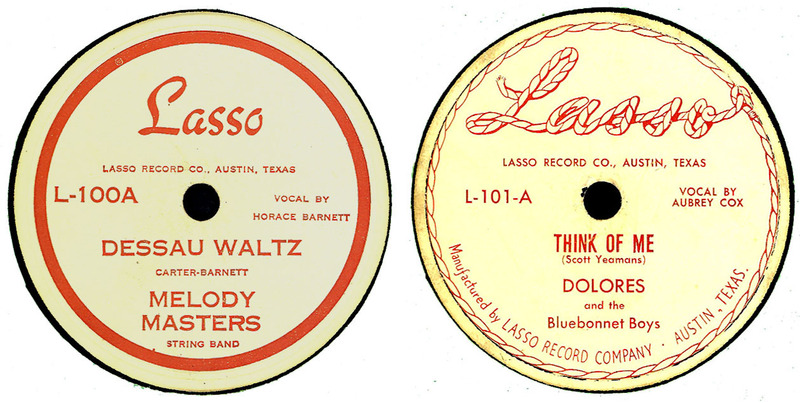 LASSO 103, 104, 105, 107 have notation “Produced By Fred M. Caldwell. Hear "Don’t You Darken My Door Anymore"
Just going through collection today and noticed that my copy of Lasso 101 has the plain text version not the rope version as pictured. Did all issues come out that way? Is one a later pressing?